Yesterday evening, Sunday evening, I had plans to get to bed, wake up on Monday morning, and go to work. 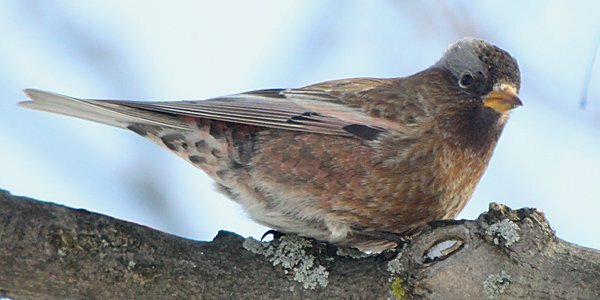 That changed when I got on the computer and learned that a birder way up in northern New York, on the Tug Hill Plateau, had reported a heck of a bird coming to her feeder. 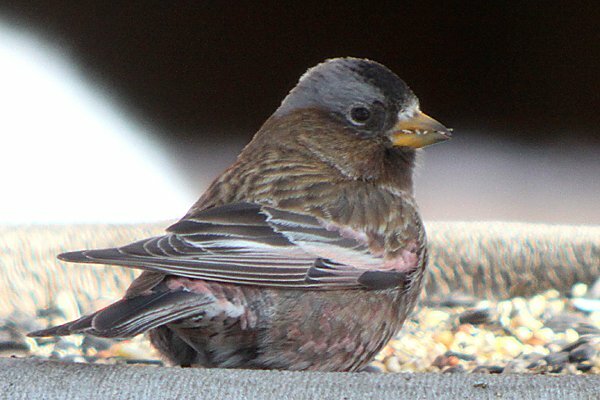 Nancy Loomis had a Gray-crowned Rosy-Finch, New York’s second* record, and I was not going to miss this bird again. 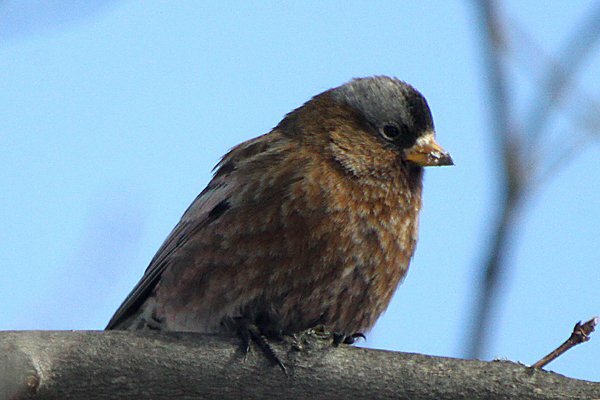 You see, the first and last time a Gray-crowned Rosy-Finch appeared in New York was this past December on top of Black Dome Mountain and I joined several other foolish birders in hiking the mountain trying to refind the bird. We dipped and all thought of ever seeing Leucosticte tephrocotis faded from my mind. This time it would be different. And at 5 AM this morning, after I had requested and received an emergency personal day from my job, Seth Ausubel picked me up with Isaac Grant, who had already driven from his Staten Island home, sitting shotgun. We motored north out of New York City to Westchester County where we picked up Benjamin Van Doren, and then it was a beeline up the New York State Thruway through Orange County, Ulster County, Greene County, Albany County, Schenectady County, Montgomery County, Herkimer County, and Oneida County. En route, we used our phones to stay in touch with other birders and learned that the bird had been seen at first light and was regularly visiting the feeders. 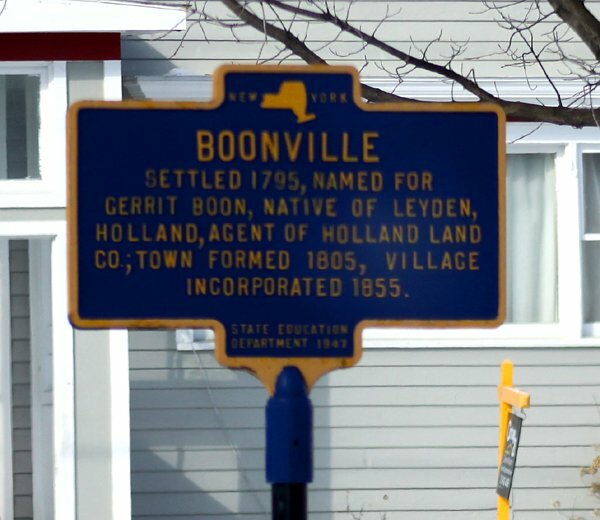 Finally, we reached Utica and headed north to Lewis County and the town of Boonville. We left Boonville on Route 12D heading north and finally reached our destination, a mauve house on the right side of the road in Locust Grove,** at 9:40 AM. 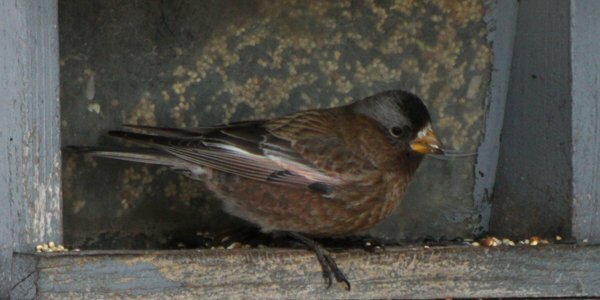 We piled out of the car and where was the Gray-crowned Rosy-Finch? Seth spotted it first, up in a tree in the front yard, but we only got so-so looks before it took off across the road and disappeared! Disaster! Noooooo!!! Not only did we not get good looks and no pictures, but we also knew that a bunch of other birders were en route and would not be happy if the bird was not around to greet them. Thankfully, the bird came back after a brief absence and put on a show worth every minute of the long drive north and west. The bird flew from feeder to tree to feeder to tree. It chased off House Sparrows but seemed shy of the Hairy Woodpecker that was also feeding. Watching this bird was a pleasure, with its plumage of brown and pink and gray and black. It was much larger than the American Goldfinches and Purple Finches that were also around in numbers and was noticeably longer-winged. Benjamin and Seth pegged it as the subspecies L.t. 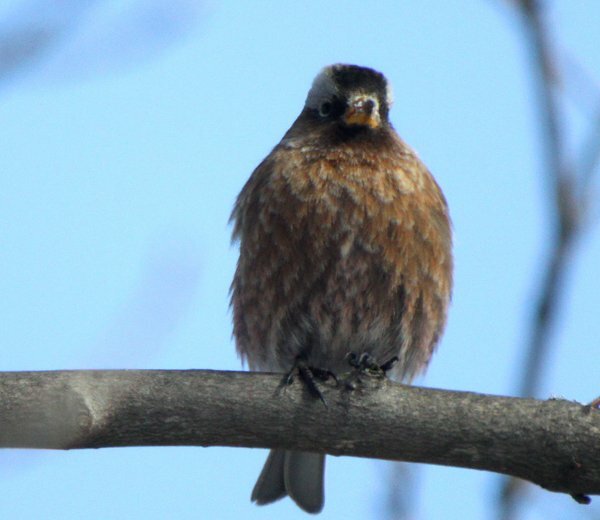 tephrocotis, the interior form of Gray-crowned Rosy-Finch, and I saw nothing to contradict them. More importantly, as other birders showed up, like Anthony Collerton, who is looking to break Richard Fried’s New York State big year record, and Will Raup, Bill Lee, Rich Guthrie, and Jory Langner from the Albany area, among others, the bird was faithful to the feeders, though it would on occasion make its way across the road. There was really nothing to do with such a good bird around other than watch and photograph it so that is what I did. What a bird! The ride back was just as long as the ride up had been but much more satisfying. If you want information about going to see this bird check out the New York State listserv archive on Birdingonthe.net. *Assuming you don’t count the single-observer, sight report from Rochester in January of 1923. **This is not Locust Grove’s first brush with ornithological fame. The ornithologist and author of Birds of New Mexico, Florence Augusta Merriam Bailey, was born there in 1863. Great bird and post! I hope to see one some day. congrats to you & the guys on a great bird! I hope it sticks around for a while to give others (like me!) time to get there. Glad you finally for the Rosy-Finch. I was looking over my photos trying to decide if there was any way to tell if it was in-fact the same bird as the December sighting. I remember the first bird as being a pit more pinkish overall, with brighter pink wings, though that may be something that fades with wear as the winter progresses. My photos definitely don’t show the whitish feathers above the base of the bill. Do you remember if that was just snow or if those feathers really were whitish? 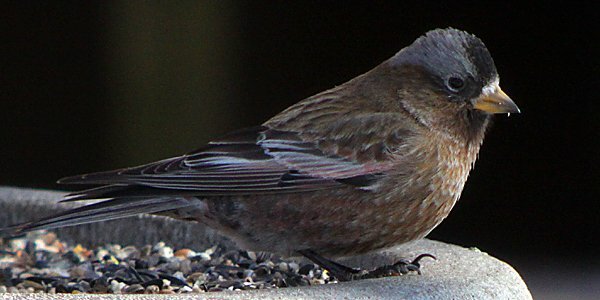 Ok, I’m starting to feel kind of embarrassed that I haven’t seen a Gray-crowned Rosy-finch in Montana yet. Wow! Congrats on getting an amazing state bird! Wow, that’s a seriously beautiful bird. Good on you for nailing the bugger. Thankyou for posting such a nice array of photos. What a bird!! I can’t believe I still haven’t seen one of these in California. They are resident up in the Sierra Nevada. Congrats on the great state bird. Wonderful pictures! What does this bird eat? He must be preferring a type of seed that is at the feeder? And there must be a mate around, too? @Everyone: Thanks! And if you can get up there it is well worth the drive. @Carrie and Vermfly: Get to it! What a beautiful bird. @David Rankin: The white at the base of the bill is definitely feathers. From what I can find online, this seems to show that it is a male bird. My guess is that this is probably a different bird than the one that you found. @Anthony: You should be digiscoping! @Kathy: It seemed to prefer sunflower seeds. And if there is another around that would be amazing – the chances of that are vanishingly small though. Corey, Great pictures. 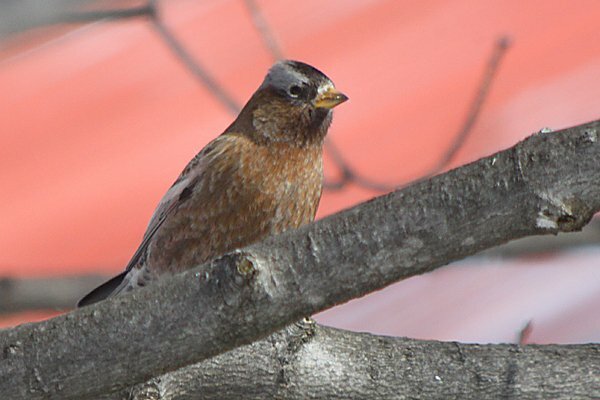 I also made the trip to see the Grey-crowned Rosy-finch. I had some great looks. I was wonder what setup You used to get such fantastic pictures? @Mike: I use a digiscoping set up comprised of a Swarovski scope, their DCA adapter, and a Canon EOS 50D with a 50mm 1.4 lens.